Urban Observatory at urbanobservatory.org is getting bigger and better. The project, launched by Esri, Richard Saul Wurman, and RadicalMedia, lets you compare and contrast cities using mapped data on everything from housing development to traffic flow and population density to open space. Contributions of map data from GIS professionals like Lauri Sohl of South Dakota and Tom Sellsted of Washington State make exploring cities even more exciting and informative. Start contributing data for your city today. The Urban Observatory contains a growing number of maps about cities, including industrial and commercial land use, youth population, and flood zones. Have you ever seen a color you liked that you wanted to use on your own map, perhaps in symbols or charts? You can use the Eye Dropper tool to easily find any color on a page. This tool shows the red, green, and blue (RGB) definition of the colors that you click on the map. Read the tip. A new, custom GIS-based sign management app called GISAssets for the Apple iPad is helping the city of Ames, Iowa, manage more than 9,500 local traffic signs. The app was built on Esri’s ArcGIS Runtime SDK for iOS. Read the article. Spatial statistics expert Noel Cressie will give the keynote address at the 2015 Geodesign Summit, an event that draws professionals who want to find geodesign solutions to complex issues. Read the article and register. Interested in developing apps using Esri geospatial technology? Then stop by DevSummit DC, on February 11, 2015, for great technical workshops and presentations by Esri staff and technology users. Read the article. Inland Empire Health Plan officials explain how they use Esri ArcGIS to better serve their members, including analyzing where patients live and where services are needed. Watch the video. 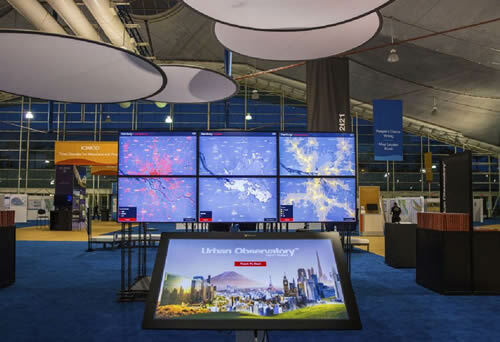 At the Big Data, Better World conference, Esri president Jack Dangermond spoke about how the growing use of spatial data will empower the public with authoritative information. Read the article in the Daily Bulletin. Learn how to add a layout, symbolize a layer, create new features on your map, and more using the new ArcGIS Pro app in ArcGIS for Desktop. Watch the videos. Want to better understand your business data and markets using location analytics? Take one or more of these four new Esri web courses. Browse the training options. Where Did That Eclipse Go? Download the 2014 US Esri Data update for Esri Business Analyst Desktop and Esri Business Analyst for Server at my.esri.com. Updates include block level demographic changes following the 2013 tornado in Moore, Oklahoma. Read the blog. How will integrating ArcGIS with SciPy, a software library for custom scientific and technical computing, help scientists and other professionals? Esri’s Kevin Butler answers this question. Read the blog. Your data will shine more brightly when you use the new dark gray canvas basemap from Esri. The basemap will soon be added to the ArcGIS Online basemap gallery. Read the blog. Talk about GIS crowdsourcing! Tweeted selfies poured in for GIS Day, populating the GISDaySelfie Story Map with selfies stretching from Accra, Ghana, to Zoetermeer, the Netherlands. See the GISDaySelfie Story Map. Complement or upgrade your existing GIS infrastructure. Get Esri ArcGIS for Desktop software with a Dell Precision Workstation or Notebook. Order today. The buzz about bees: They come in all colors, shapes, and sizes depending on where they live. Meet the Polysocial Hairy-tongued Bee from France, the Sawtooth Sputnik Bee from Kenya, and more, in Geography Bee: A Global Gallery of Pollinators, an Esri Story Map Tour. View the map without getting stung. Matt Carmichael, editor of Livability.com, counts on Esri data in researching the best places to live, work, and play in the United States. Listen to the podcast.